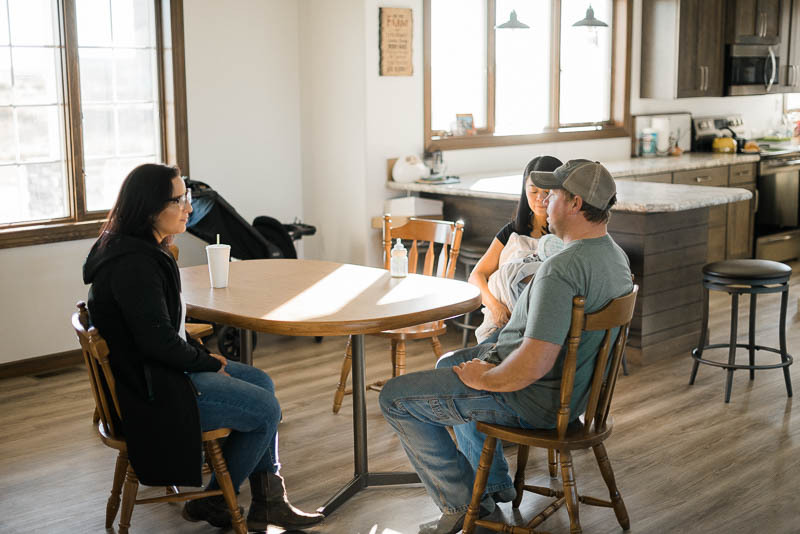 It’s always a pleasure to sit down and open up a conversation about food and farming with South Dakotans and the farmers who grow it. In fact, that’s what Hungry for Truth is all about. 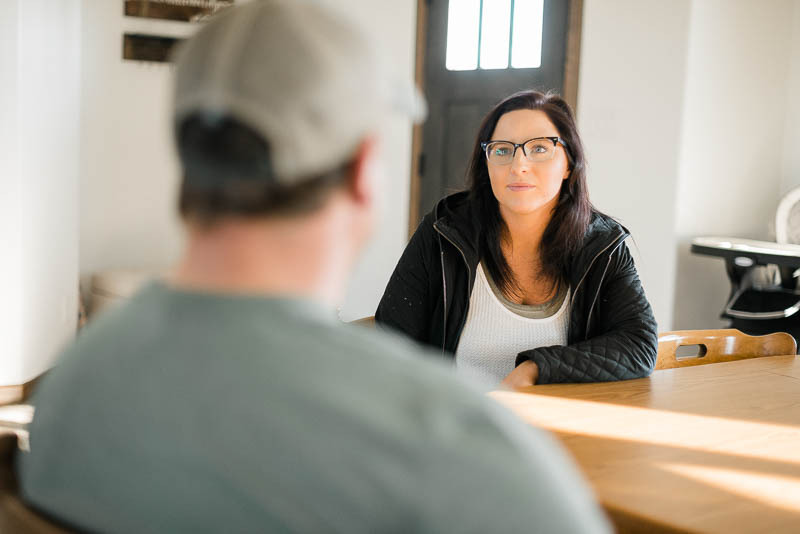 True to our mission, we had another wonderful opportunity of connecting, South Dakota native and Augustana college student, Sara Waldner with soybean farmers, Matt and Sari Bainbridge of Ethan, South Dakota to chat harvest, sustainability, livestock and the business of farming. 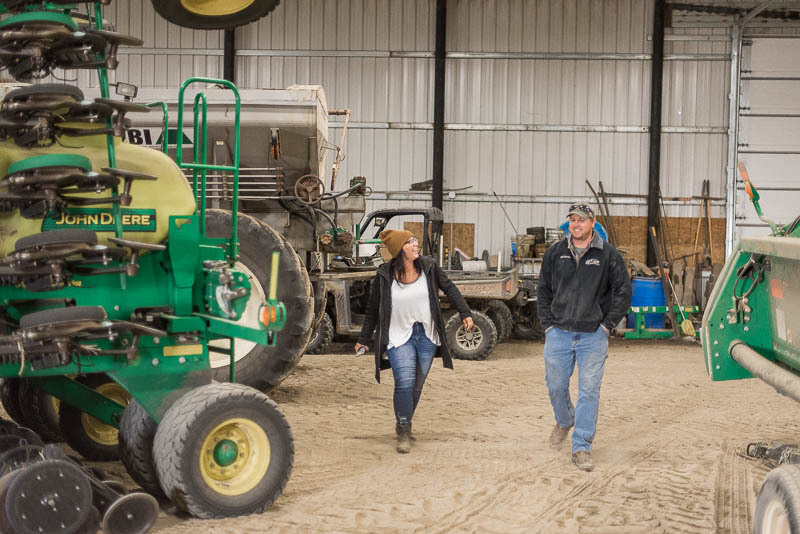 They spent an afternoon together filled with good conversation and farm education. 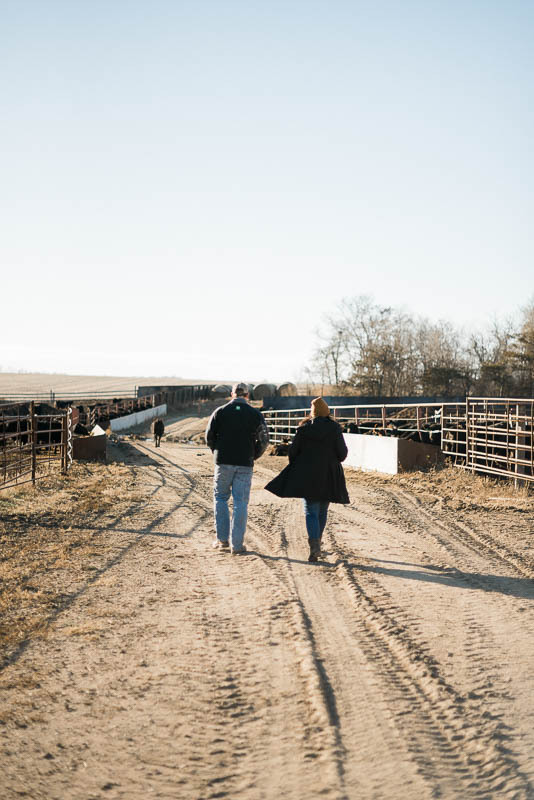 Today, Sara is sharing the highlights of her recent South Dakota farm visit. I am so excited to share with you my experience touring Matt and Sari Bainbridge’s family farm. There are so many hot button topics in agriculture and food right now, and I was excited to hear first-hand how those topics affect farmers. Passing by golden fields on the way to the farm in Ethan, SD, I got a chance to think about my roots in agriculture. Being from the small town of Hartford, SD, I have always been around agriculture. But what is my history with ag? Well, I did not grow up on a farm nor did my parents or grandparents have a job dealing with agriculture. Rather, I took agricultural education classes in high school and was involved in FFA in order to advance my leadership and communication skills. Without planning to, I fell in love with the different aspects of the industry and became an advocate for truth in agriculture. When we arrived at the Bainbridge farm, I met Sari and her newborn son, Zach. Matt was on his way back from the field, where a problem with his combine’s engine will end up costing him around $10,000 in repairs. That’s not to mention the opportunity cost of the time lost that he could’ve been harvesting. Right away, I am reminded that while the technologies available to farmers have drastically improved since the days of the sickle, there are still problems that can arise in the day-to-day operations that are unexpected. Matt and Sari were welcoming and friendly, and we all were excited to talk about what I wanted to learn about. Even after being involved in FFA, I still had so many questions about what the day-to-day life of a farmer was like. One thing I always had questions about was how exactly a crop goes from seed to harvest. 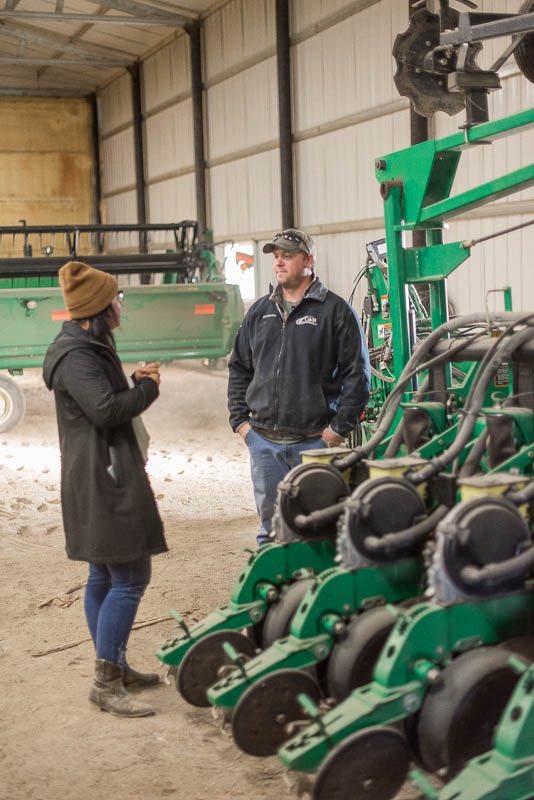 Matt was able to walk me through that process and show me the equipment he uses for each part along the way, from planting to fertilizing to spraying to eventually harvesting. 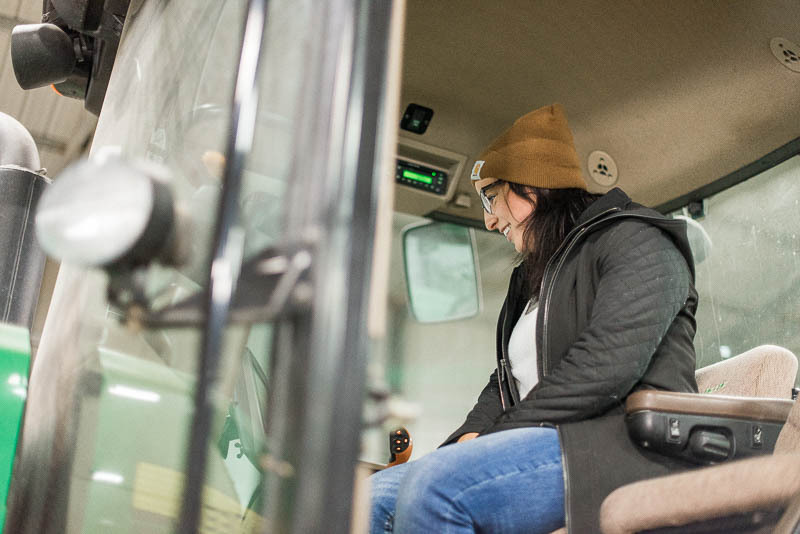 I even got to hop up inside of the fertilizer spreader and the combine to see the GPS systems that Matt uses to farm more efficiently. For example, Matt used to spread the same amount of fertilizer over his entire field. Now thanks to GPS systems and intuitive land surveying, he is able to strategically spread his fertilizer as to not over- or under-use fertilizer and instead put exactly the amount needed on each acre of his field. We talked about farming, but we also got to talking about my background and where I am from. I could tell he is a guy that cares not only for his land and his family, but for the people around him as well. After my tour, I had a deeper appreciation for farmers and their daily activities. 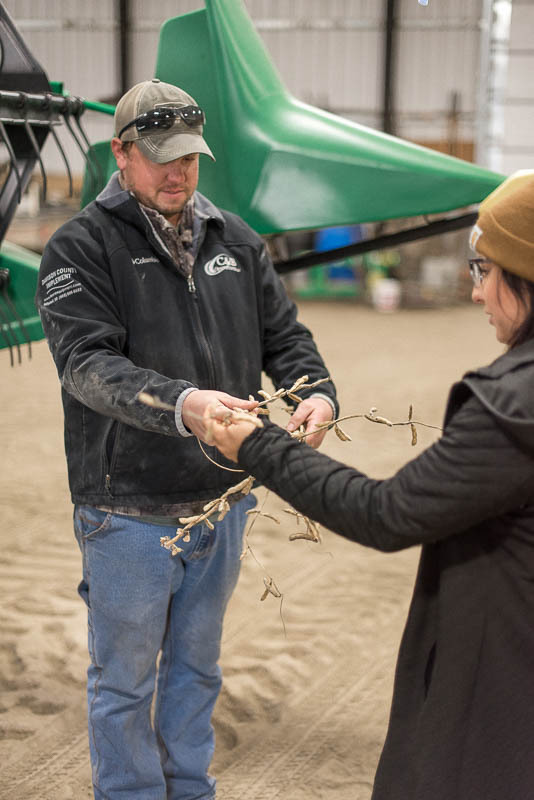 Matt was able to confide in me that each year, depending on the weather, seeds, and any troubles that may come about (*cough, cough* broken combine), they may or may not make a profit. He was calm, cool and collected when he told me that last year his family did not make a profit from their labor. That was crazy for me to understand!!! After working so hard day in and day out, at the end of the day if seed prices aren’t right or if rain floods your fields, he could be left with nothing to show for his work. I have so much more respect for him and the men and women like him who still go to work each and every day to provide food for the people around the world. The experience was engaging and thought-provoking, and I was reminded how much farmers truly care about connecting with us through our food and initiatives like Hungry for Truth. Sara Waldner is a senior at Augustana University with majors in Communication Studies, Business and Media Studies. 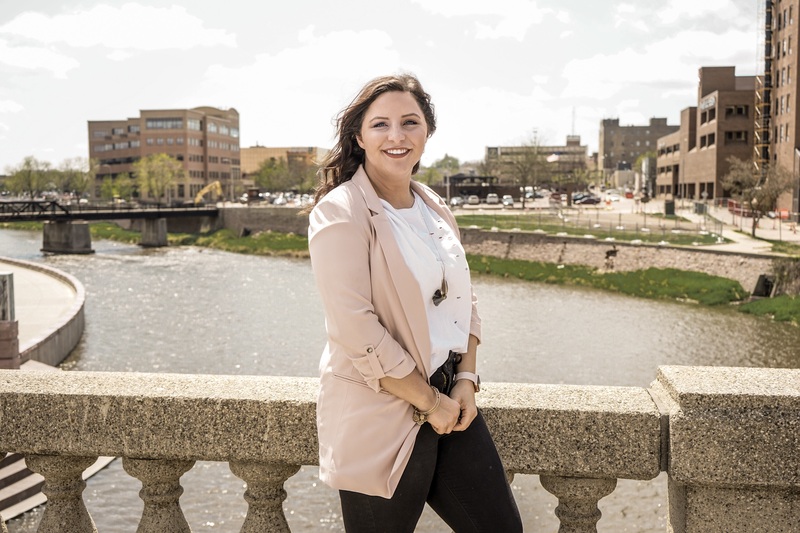 Growing up in Hartford, SD, she loves small town vibes but the vibrancy of a larger city. While attending Augustana, she has been involved in the Civitas honors program and Public Relations Student Society of America (PRSSA). Sara has received her American Degree with FFA, commemorating the four years she spent involved with the organization including two national titles. With a creative mind and an energetic spirit, she is eager to get into a career after graduation in the field of marketing. She currently works at Serendipitous Events as an event planner and at Year Round Brown as Assistant Manager.